Greek Mythology is always a treat and miss Aimee Carter is always a pleasure. Presenting Goddess Test #2.5 The Goddess Legacy by Aimee Carter. For millennia we've caught only glimpses of the lives and loves of the gods and goddesses on Olympus. Now Aimé e Carter pulls back the curtain on how they became the powerful, petty, loving and dangerous immortals that Kate Winters knows. Calliope/Hera represented constancy and yet had a husband who never matched her faithfulness... Ava/Aphrodite was the goddess of love and yet commitment was a totally different deal... Persephone was urged to marry one man, yet longed for another... James/Hermes loved to make trouble for others-but never knew true loss before... Henry/Hades's solitary existence had grown too wearisome to continue. But meeting Kate Winters gave him a new hope... Five original novellas of love, loss and longing and the will to survive throughout the ages. After reading about all the exploits of Kate Winters as Hades/Henry's new wife in the underworld and an ending that horrible and tantalizing cliffhanger, its time to get some background on the Gods. 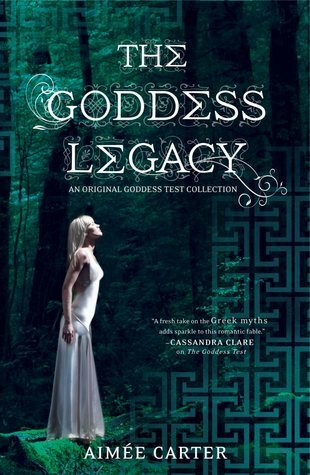 So enters this anthology of novellas, The Goddess Legacy, giving us explicit knowledge as to how the Gods came to the position as we see them in The Goddess Test and in Goddess Interrupted. The book consists of five novellas focussing on Calliope, Ava, Persephone, James and Henry. Showcasing how Calliope does what she does, how Persephone repeatedly breaks Henry's heart, how Ava decides commitment does not come easily when your the Goddess of love, how James learns what true loss really means and what Henry felt after Persephone decides to forgo immortality for Adonis. Wherever we are and whatever we do, be it for a human or a God there is only one thing that matters and only one thing that decides what our future us going to be like - its the choices we make in the present that decides it all. Calliope's situation arose because of her own pride and her inability to let go of a love that was never meant to be (for Henry). For Ava's story, it gives us the understanding of how her mind works, how she learns to commit herself to Hephaestus/Nicholas and is honest about her affairs to her husband even if they are so wrong... which we definitely we can't say about Persephone who thinks she is far above from Ava. For Persephone and her loveless marriage to Henry - it can be seen that her mother only wanted Henry's and her happiness but she (Persephone) was never bold enough to voice her thoughts in regards to her betrothal. Maybe then the centuries long disaster would have been avoided. Here again the point of choices appears. Persephone made some bad decisions regarding Henry, regarding the way she conducted her life. Because in Demeter/Diana's words both Happiness and Misery are a choice and Persephone chose misery......Sorry i'm rambling right now but I have this constant tiff with Persephone for causing Henry so much pain and to Calliope for poking her nose where it is not needed. "Its a rare and intricate look to the life of the Gods before Kate came into into their lives"
OOh nice review! Sooo agree about Persephone and Calliope! Although Ava really bugged me too. Her ways are sooo not in sync with my beliefs about love! Ugh...April 2013, and I originally thought that this book was going to be book 3 when I heard about Aimee having another release. Massive upset when I learned it was just novellas, but it was still an incredible read!! But oh, man! That cliffhanger!! It was dreadful! Nice review and thanks for reading mine!